LAWRENCETOWN, N.S. — A Nova Scotia man is praising the efforts of the family dog for helping save him and two young boys who were buried under a heavy mountain of snow after their fort collapsed on top of them. Steve Bayers, his son Ben and his friend Adam Inch were building a snow fort in Lawrencetown on Saturday when the roof suddenly caved in, pinning the man's arms and legs underneath him. "(Ben and Adam) were laying down in there taking a break inside the fort and I was shaving some snow off the ceiling with a small plastic shovel. Snow was falling on them and everybody was laughing and having a great time. And then the lights went out,'' said Bayers in a phone interview Tuesday. Bayers said the two boys were just feet away from him, screaming in the pitch black, but he couldn't move under the weight of the snow to help them. He told the two 13-year-old boys not to panic and to keep breathing. 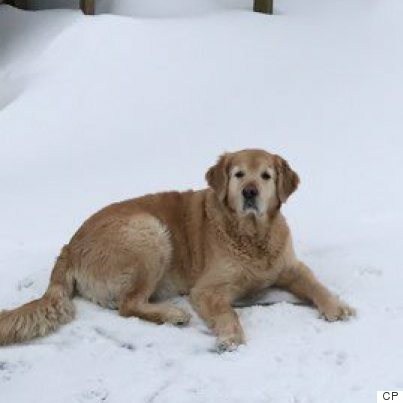 Bayers said it seemed impossible to get out until his five-year-old golden retriever, Zoose, began digging him out of the snow. "I heard a bark and felt a tugging on my jacket, so I knew it was my dog,'' said Bayers, adding that he's not sure how long he was trapped under the dense snow. Bayers managed to free himself and began calling for help, alerting a neighbour and three friends, who ran over and started shovelling through the heaps of snow to find the two boys. He says they were buried in the pile for about 10 minutes. "They were screaming that they couldn't breathe, but I knew if they were screaming, they were breathing,'' said Bayers. The incident left Bayers with a broken fibula and twisted knee, while his son has a minor concussion and sore neck and shoulder. Inch is sore, but was not injured. Bayers described it as a "near-fatal incident.'' He wanted to tell his story to warn others about the dangers of snow forts and tunnels. "If I had left those kids there alone, they would have never got out,'' he said. "If you are going to build a fort, there should always be an adult there — and do not have a roof on it, and if you do, it has to be a very thin roof.